The Creature P O E T was not underſtood. But came by meer Equiv'cal Generation. As hated too, as they are, and unfed. Scarce knowing POETS, leſs by POETS know. Yet this poor Thing ſo ſcorn'd, and ſet at nought. Ye all pretend to, and would fain be though. T' Adopt ſome baſe Born Song that's not their won. To pleaſe the Importunity of Friends. 'Twill Venture his bought Place, to' Aim at Wit. Till Common Senſe forſake Him, Hel Tranſlate. The Lords will Write, and Ladies will have Swains. And warn them Early from the Sin of Rhime. This laſt Experiment, O Parents make! The Pariſh Whip, and Beadle by his Side. To keep his Brains clean, and not foul the Land. And get the Knack of Dulneſi how to Thrive. 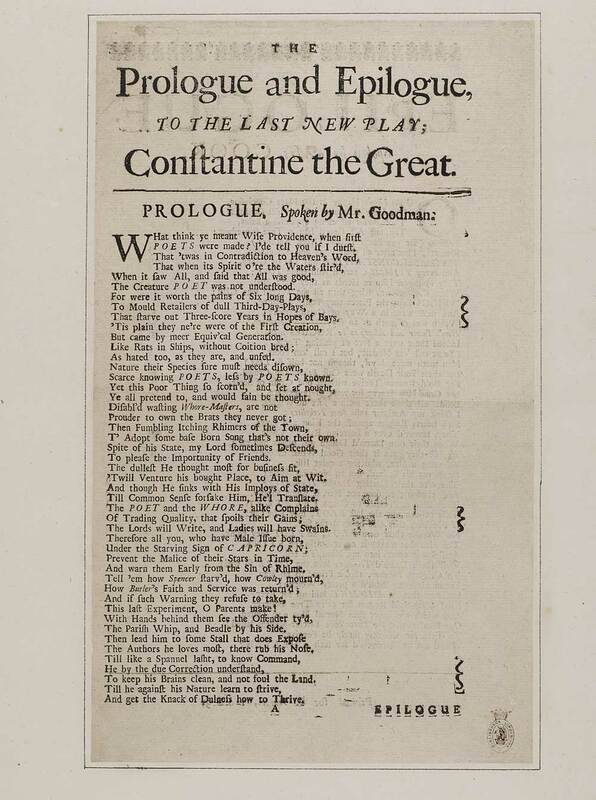 First line reads: What think ye meant wise providence, when first. In one column, with the epilogue printed on the verso. 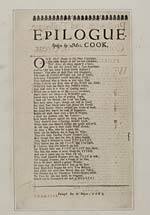 The prologue to the play by Nathaniel Lee was written by Thomas Otway; the epilogue by John Dryden.